I think the next two years we will see a big change in the UK Bus Network as we know it in and out of London very sad times ahead a lot of "use it or lose it" is going to happen in a lot of places as with cuts etc it is just not financially viable for a lot of routes to run also expect to see a lot of small firms have to give up trading or get sucked in to being taken over by the "Big 4" and possible redundancies . Sort of agree with that but I think it will be worse. There is more than one influence on the provision of bus services. Council funding is part of the issue and a serious one in some parts of the country. However if we have a recession and job losses then that will wipe out discretionary spending on leisure / shopping as well as reducing employment related bus journeys. If that happens then the impact on commercial operators will be very high. If almost everyone in the country ends up worse off (as I expect) then bus use will plummet. This will cause not only smaller operators to go out of business but also retrenchment in the big groups. Heck if First Bus cannot make Greater Manchester pay then what hope is there for some parts of the Midlands, the West Country, all of the Met Counties. So many places are now past the tipping point where the majority of residents have cars and use them to the detriment of bus service usage. I can certainly see all of the big groups possibly wanting to dump operations in parts of the country - nowhere is safe in my view. The only small opposing force in all of this is emerging concerns about the ability of people to afford car finance / leasing deals. There are suggestions that many people will be in serious financial trouble if their incomes fall because they will not be able to afford their mortgages *and* their car financing deals. The other concern, subject to a lot of debate, is whether there has been mis-selling of car finance deals and what the fall out from that will be at some point in the future. Even if the car market was to suffer a severe dislocation I doubt there would be much transfer back to public transport - in many areas there is no public transport to fall back on if you lose your car. The big danger for the government in all of this is that if the big bus groups all have to retrench and lose scale then their ability to bid for and finance rail franchises will decline. This will imperil the level of competition for rail franchises leaving the government with a real problem on their hands. I suspect that European railways will not be terribly keen to bid for UK franchises in the future because several are at risk already of losing significant sums on existing franchises. I don't see the looming "B Word" helping matters either. So a wonderfully bright future for UK public transport then. 2. London. Well we all know TfL are struggling financially. I think Brexit will play a huge part in a bigger fall in profits, if the worst case scenario plays out. By this, I’m thinking less people commuting into the City, feeding into the network from mainline train hubs. A glimmer of hope though, could come with a more environmentally aware younger population. TfL need to embrace electric transport as per Paris. The new buses on the 46,70 and C1 I think are better than their diesel stop / start sisters. Anecdotally, I know quite a few people who do live in London in their 20’s who aren’t bothering to learn to drive, and they use buses. The 24/7 culture is here to stay, and I think the bus network should play a bigger role here, and more night routes or day routes running all night, should be explored. I don’t think on demand will work in London and am at a loss as to why TfL are borthering, when the concept has been tried by a few private firms of late, none standing the test of time. Uber have this wrapped up. Publicity is important. TfL should advertise the bus network on the tube. We will be lucky if passenger levels hold firm, but from my recent travels, I’ve been pleased to see routes like the 18 packed to the rafters still , with very many travelling into London from Sudbury and Wembley, Just goes to show people will use a high frequency route, for less money than the tube, provided they don’t have to wait long for it to come. To save money , TfL should cut where it is clear usage is no longer justified. But should also prioritise routes which are proven to be successful still, indeed growing. 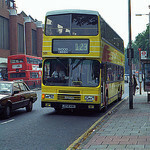 I saw a double deck 203 yesterday morning at Hatton Cross, full up, bound for Staines. One example of a route which has massively increased patronage. To be honest, they don't care whether its electric or coal; many of the younger generation couldn't give two hoots. They are the ones not using buses and are using uber instead; even youths who have free passes. Goes to show that time is of the essence. TfL really do not get it, keep slowing services down, encourage lower speed limits etc. and you WOULD lose customers. TfL do not know how to advertise properly. But then they would more than welcome loads of uber adverts across there network to pinch their customers. 24/7 culture is on a downturn, many clubs have closed and bars no longer opening as they were.